31625 in BR days. Unknown Shed. 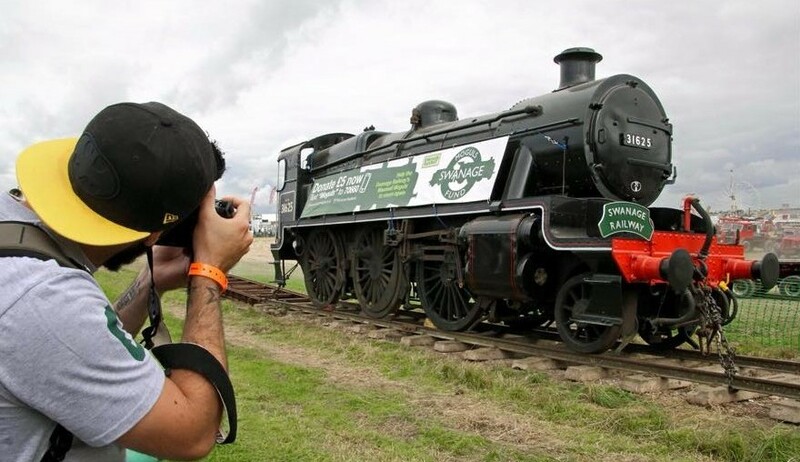 Whats Unique about this loco? It’s the only U class to have run on the main line in preservation. U 31625 is the youngest of our three Maunsell Moguls. 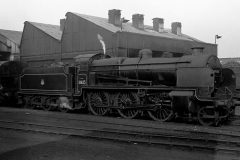 Unlike 31806 it was built as a U class but it does still owe its existence to the problems experienced by the K Class. The 31806 Biography covers these in more detail. 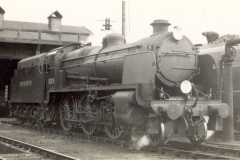 The U class was designed after the N & K classes as a replacement for several elderly 4-4-0 classes from the former SECR. 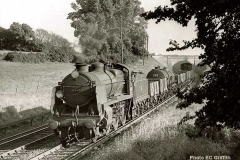 It was an extension of Maunsell’s standardization program and essentially a tender variant of the K Class tank, or to look at it another way, a passenger version of the N class with 6′ driving wheels. The design had been completed before the fatal K Class Sevenoaks Crash in Aug 1927 but none had yet been ordered. 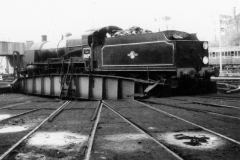 At the time of the accident, construction had just started on a further 20 K Class tanks ordered the previous year. Ten each were being built in Brighton and Ashford Works. The K class design was implicated, perhaps unfairly, as contributing to the accident and as a result, work on the batch of 20 Ks was immediately put on hold. 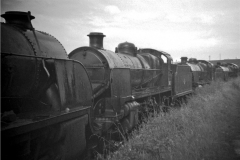 In 1928 the decision was taken to change the order to the U class tender engines and work was restarted. The 3500 gallon tenders were sourced from Armstrong Whitworth. There were some minor differences between the ‘as built’ U’s and the ‘converted’ U’s. 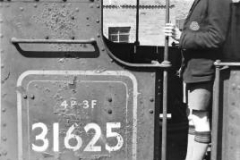 The running plate over the driving wheels was higher allowing better access. This had had to be kept low on the K Class to accommodate the side tanks. The cab windows are a different style and the dome top is flatter. 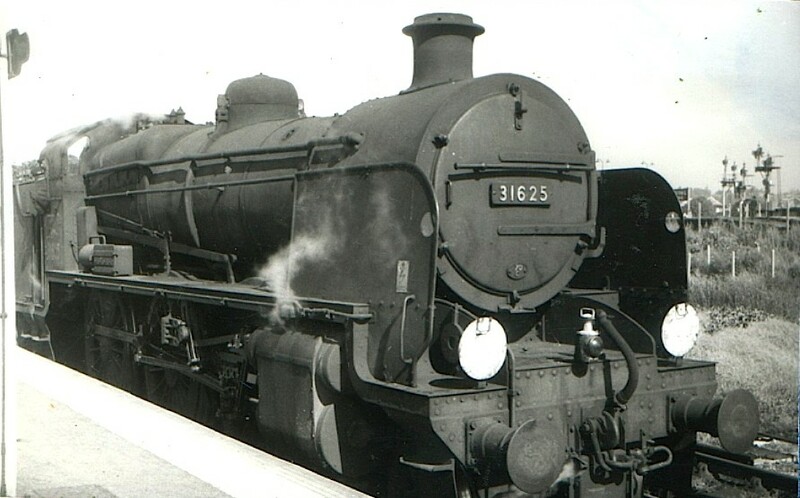 The final batch built later in 1933 had left hand drive but our loco retained the right hand drive in common with 31806 and 31874. No A625 emerged from Ashford Works in March 1929, seven months after its stable mate, No A806 (31806), had been rebuilt as a U in Brighton. The ‘A’ before the number was a carry over from the 1923 grouping when a large number of smaller railways were combined by Act of Parliament to form ‘The Big 4’. The South East & Chatham Railway, Ashford Works and Richard Maunsell, their CME were absorbed into The Southern Railway. The A for Ashford was added to all the locos originating from ‘Ashford Design’ hence the N’s K’s and U’s all initially carried it including the ones built at Brighton under Southern Railways. 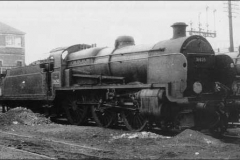 When the second batch of U class locos (or third batch if you count the K rebuilds) were built between 1932 and 1934 the whole class was renumbered and the prefix dropped. 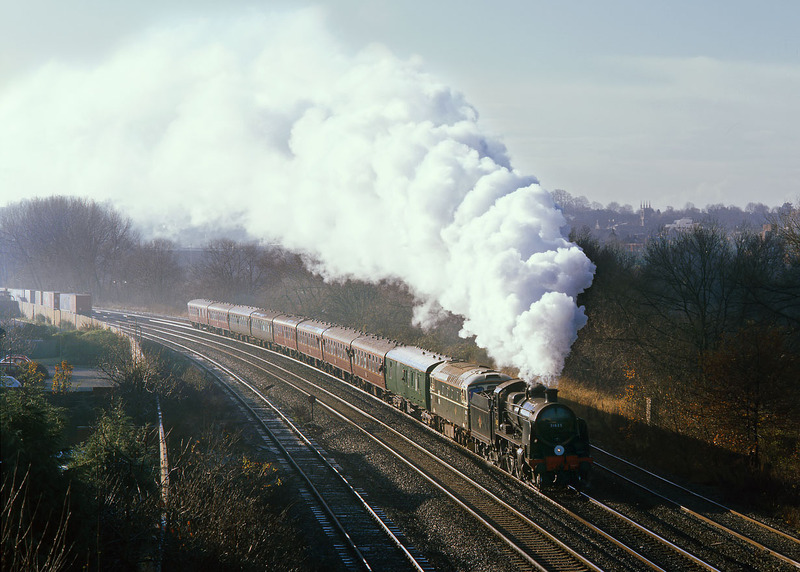 No A625 became No 1625 and around the same time gained it’s smoke deflectors. Records on shed allocations differ and if you have any firm information we would be pleased to hear from you. 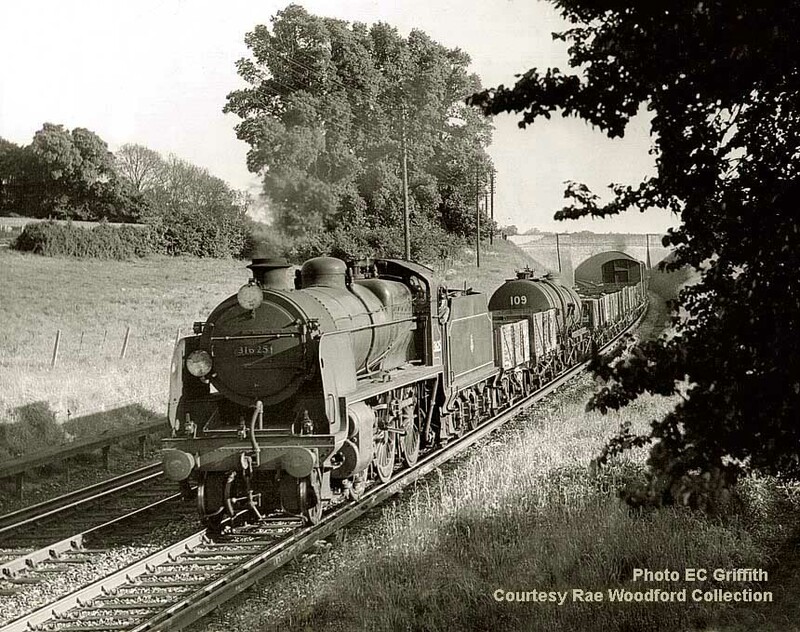 Its first allocation is unknown to us but we believe it was at Nine Elms in 1931 and Guildford in 1935. In Jan 1939 it was based in Salisbury and left the works with a new 4000 gallon tender; these were wider and had the coal plates turned inwards. The 3500 gallon tenders were transferred to the Q class. 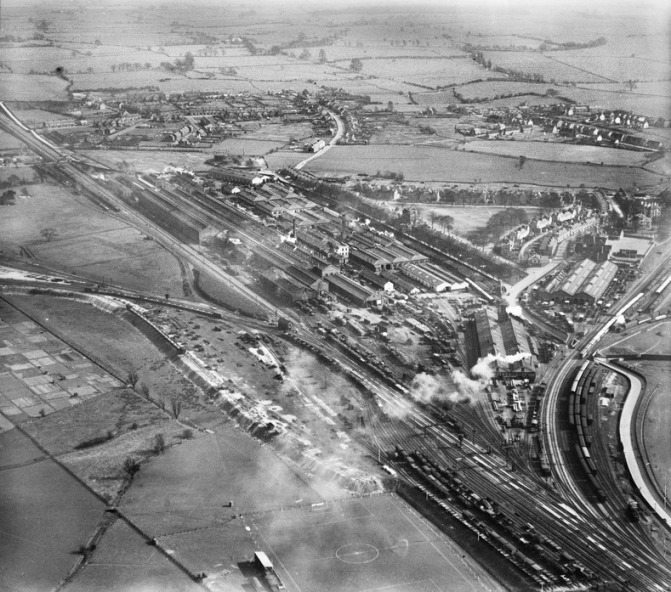 In 1945 it moved to Basingstoke and then to Exmouth Junction at an unknown date. 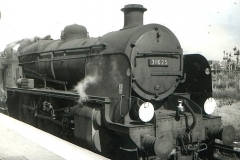 In November 1947 it was converted to oil firing at Ashford Works necessitating a change back to the 3500 gallon flat side type of tender and this is how it spent the first year of Nationalization. The oil firing experiment was part of a government scheme to ease post war coal shortages which had lead to a fuel crisis the previous winter. 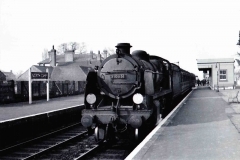 In February 1948 it was fitted with ‘electric lighting apparatus’ similar to that fitted to Bullied Pacifics. Before the year was out however the oil firing trial was abandoned due to lack of foreign currency and difficulty obtaining supplies. 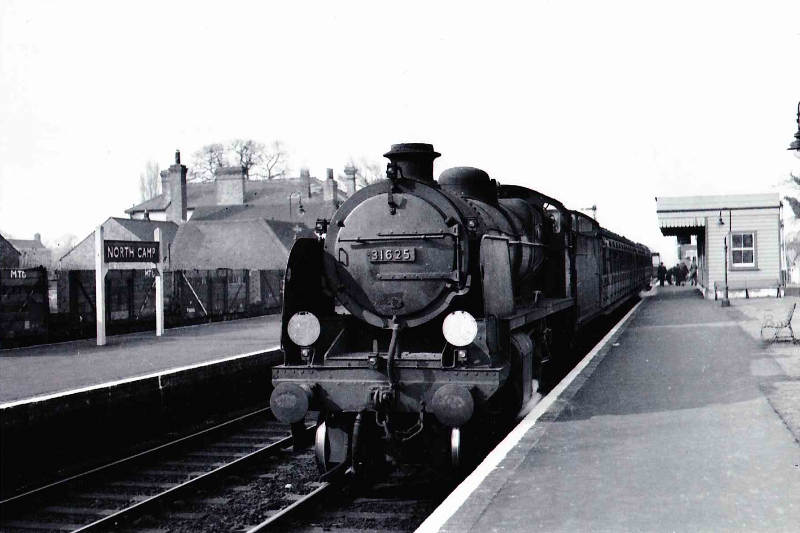 It was reconverted to coal in November 1948 and received its BR number 31625, power classification 4P 3F and mixed traffic lined black livery. It retained the electric lighting and the same 3500 gallon tender for another few years. 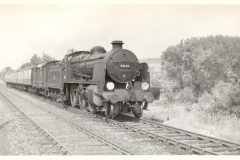 On 10 May 1951 it was reallocated to Guildford where, apart from a 5 week loan to Eastleigh in Aug- Sep 1953, it remained until withdrawal. 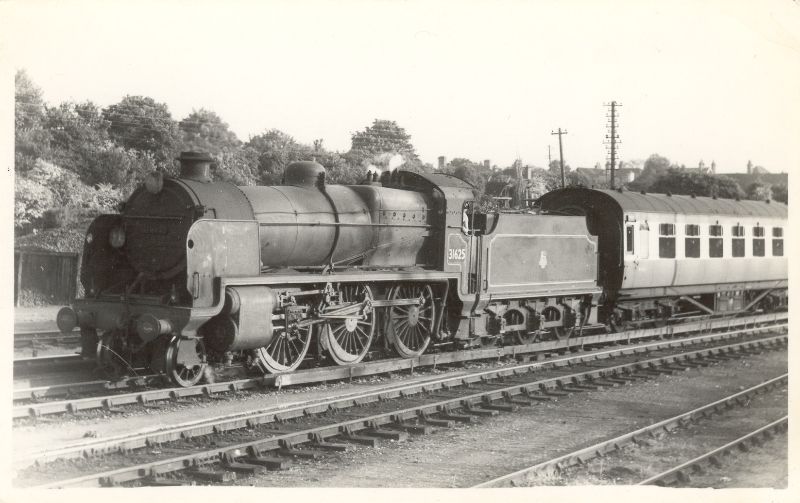 It went for General Repair at Ashford Works in 1956 and in Oct 1958 it went to Ashford to be fitted with new cylinders with outside steam pipes, improved drafting and a BR standard chimney, leaving the works in January 1959. This modification was applied to a number of U’s and N’s including both its stable mates and it was usual to replace the front section of the frames at the same time but in this case the whole frames were completely replaced, probably due to cracking, common in the lightweight frames. 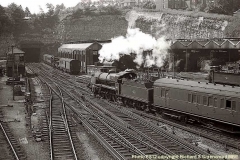 If you look carefully at the top picture you can see the original frames are straight between the bottom of the smoke box door and the top of the buffer beams where as in the later picture at Reading South the new frames are curved. At the same time it also had its exhaust injector removed and two live steam injectors fitted to the LHS. Some time later it was fitted with AWS, the battery box being sited on the right hand side running plate. 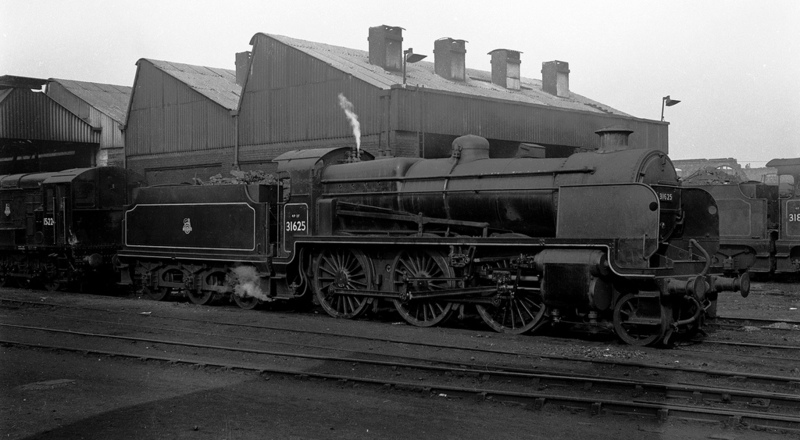 It finished its working life at Guildford on 12th Jan 1964. 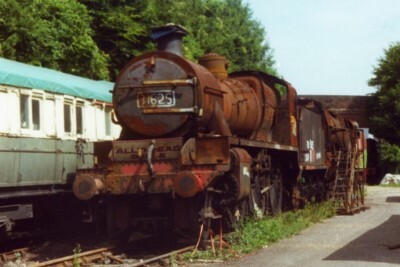 The loco was withdrawn from service and 5 months later moved to Barry scrapyard Wales. 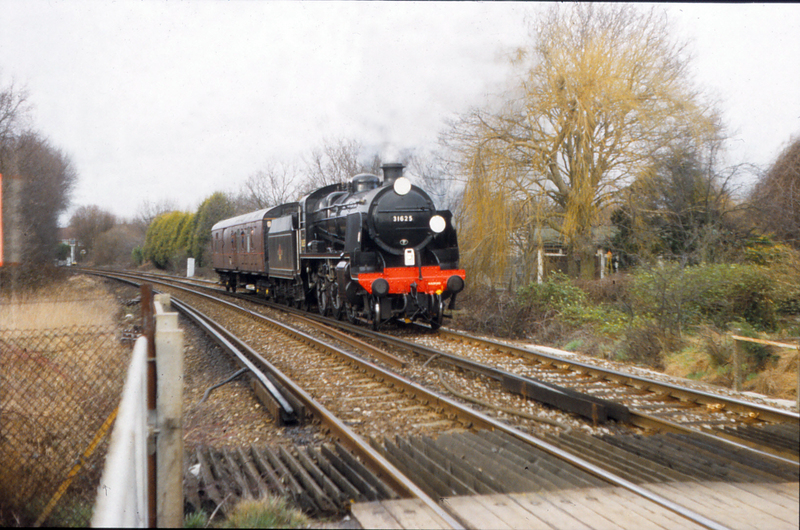 31625 near Culham on its first Main Line Tour, The Pines Express on 13 Sep 97. Martin Loader. It remained in Barry until 1980 becoming the 111th loco to leave the yard. 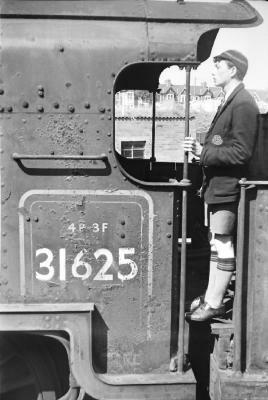 By this time Woodhams had begun scrapping the tender tanks and selling off the chassis for conversion to Ingot Carriers for steel works and 31625’s tender was a victim of this. It had also lost a lot of its motion. 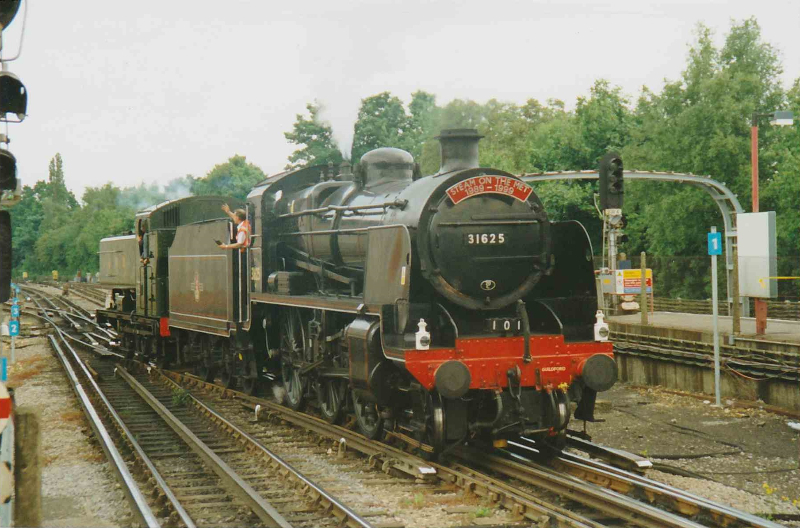 It steamed for the first time in preservation in 1996 on the Mid Hants Railway using 31874’s boiler. 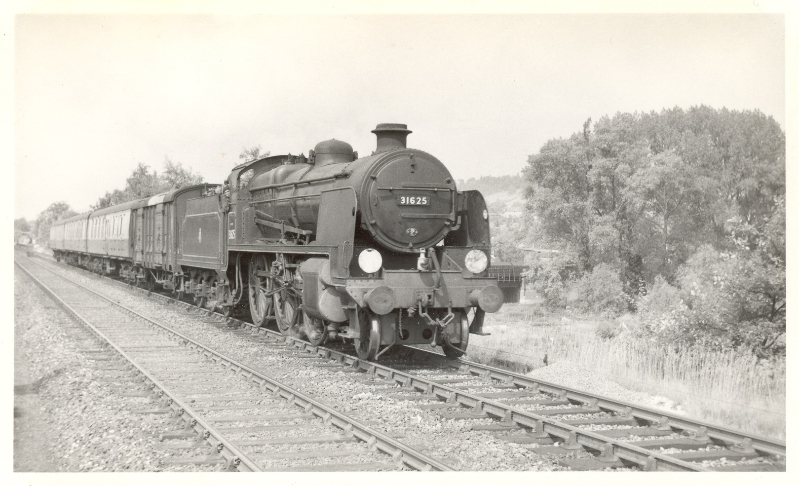 It also borrowed the motion, tender and a few other bits from 31806 which was out of traffic at the time. 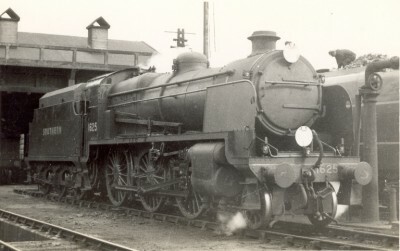 The overhaul had taken just 18 months. A huge achievement with the facilities available at the time. In 1997 it became the first and so far only U class to run on the main line in preservation when it successfully completed a mainline test run on 20 February. After a string of cancelled tours due to fire risk or insufficient bookings it finally worked ‘The Severn Venturer’ on the 13th September followed by ‘The Pines Express’ Guildford to Crewe rail tour with Class 33 D6593 on 22nd November. It was again unlucky with postponements and cancellations in 1998 but in 1999 it ran the West London Explorer on January 9th and the Capital Explorer on January 30th. 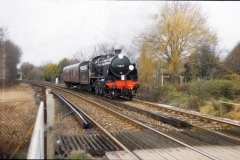 In May it worked five “Steam on the Met” dates between Amersham and Watford. Other tours were planned for 2000 but boiler problems meant its main line career was curtailed. It was repainted as James the Red engine and worked on the Mid Hants but hauled its last train in 2001 when further boiler problems caused it to be withdrawn early and stored. In 2014, 31625 moved to Swanage Railway where it now awaits its turn for overhaul. 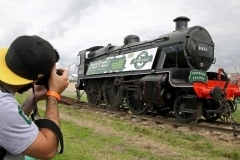 It visited the 2015 Great Dorset Steam Fair where it launched the Swanage Moguls Appeal. 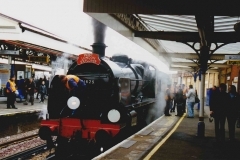 It continues to help raise awareness by being displayed on the Swanage Railway with the Swanage Moguls Banner. The chassis is thought to be in reasonably good condition having only worked 5 years in preservation. It still carries the boiler swapped with 31874, but as this is the 13th boiler carried during its life, there is no hurry to swap them back for the sake of authenticity. We hope to de-tube the boiler during 2016 to allow a full assessment. 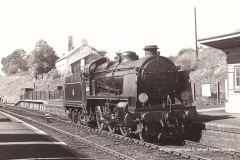 A partly built tender is available which has been constructed using an ex ‘Schools’ class chassis that BR converted to a Snowplough. 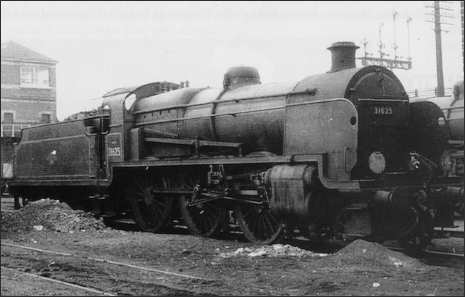 We hope it will enter the works in 2017 once 31874’s overhaul is completed and 31806 has had some intermediate work on its ‘motion and axle boxes’. We hope that by then sufficient funds will be available to start work. Please go to the donations page to see how you can help.